She is the second to last window under the Roof. There is an old hotel here in south east PA. This place has been abandoned for years. I don't know the name of the place, but I do know that it was a fire that finally closed the place down. It's near Bushkill PA.
We went there during the day. My Step-Daughter who is now in college came to see us. We wanted to do something special with her, so my husband found out about this hotel and got directions there. He didn't tell me the name of the place, we just went and now he wont even talk about it. I tried to ask the name and boy did I get a dirty look. Anyway, I was some what of a believer in ghosts but was not sure. Till NOW. My step-daughter and I went close to the building and we were talking on our way up when a pebble came flying at us. We laughed it off and joked about a ghost telling us not to come in. So we went closer and we swore that my husband who stayed close to the Jeep while on the cell phone called out to us. (Sounding like a woman lol) We turned and he was not looking at us and he was far away talking on the phone to his boss. Again we laughed it off. So we get close to the building and laugh at the warning signs and all of that and I took a ton of pictures. She was going back to college that Monday so I had only one day with her. I didn't upload the pictures till the night she left..I was very depressed. ;) After I did the up load, I looked at the pictures on my camera...that's when I doped it and went dizzy. I paniced and almost passed out, with shock...even took my blood pressure it was LOW. I saw a picture of a woman in the window. She was looking right at us. I calmed down and told my self that my eye's were playing ticks on me...it was late and I was tired. So off to bed I went. I asked my husband to look at them with me too see if he noticed anything. Well he did. "Who is in that window?" We looked at that picture a thousand times trying to figure out what it REALLY was, we had friends who refuse to believe in ghosts look at it for a reasonable explanation...NOTHING..Everyone and I mean EVERYONE Freaked out. So I had no option, I sent the picture to my Step-daughter and she called 5 mins after I sent it to her...SHE FLIPPED OUT! "WHAT THE HECK IS THAT?" We didn't know. Hubby will NOT talk about it...at all. There has to be a reasonable explanation for all of this, I just don't know what it is! You're right Kate, that is one creepy photo. I can see someone in the window looking right at you taking that picture. I can't help but wonder why your husband is so creeped out that he don't even want to talk about it. I wonder if something happened or he felt something when on the phone. If you ever find out the name of that hotel let us know. 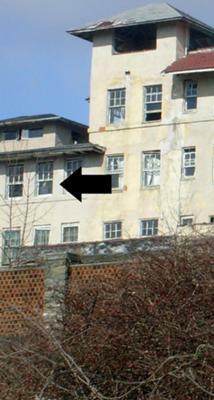 I would be interesting for a paranormal team to go and investigate.